While scanning the voter registration and naturalization microfilm at the Toledo Lucas County Library this week, I also located Martin Plenzler’s Certificate of Naturalization. Click the image below to see a full-sized high-res scan of the document. Like Andrew Przybylski’s son, Frank, Martin Plenzler was naturalized under his father’s effort for citizenship. I did not find his father’s (Joseph Plenzler) naturalization documentation, but it is clearly stated here that Joeseph Plenzler was naturalized on 19 October 1891. We know that Joseph arrived prior to 1884, when Eva and her first two children, Martin and Joseph, sailed from Hamburg. Son John was born the following year in 1885. A bit more library goodness to be posted in the near future. Holiday weekends: not meant for shopping but genealogy overdoses! As we’ve just celebrated Thanksgiving, I have spent the majority of my downtime eating or working on genealogy. And this is in spite of the fact I live in Columbus, Ohio where a hotly held football rivalry is held annually (good job this year, Michigan <snicker>) and that everyone else is out shopping. It is times like these, when I can let go of the housework and put aside other distractions, that I can make some real connections and really absorb what the overwhelming amount of data that is collected means. This weekend, I’ve come to appreciate the results from researching collateral relatives–those that are not linearly related to us such as grandparents and great-grandparents–and truly understand the value of those aunts, uncles, cousins, and in-laws can bring. In my family, that means much work and effort–my mother’s side of the family probably could populate a mid-sized city. But it was through the Plenzler and Przybylski families that I came to understand more fully my great-grandparents’ lives. Eva Dauer and Joseph Plenzer as well as Frances Rochowiak and Andrew Przybylski were relatively obscure to me until I started putting the dots together with their children. For instance, I never would have fully understood that Andrew had been a naturalized citizen of the United States unless I had pursued all of his children’s births nor would I have even been able to pinpoint a time frame for his immigration without knowing his children’s births. It was his daughter Rose who was the last child to have been born in Poznan in June 1880 and his daughter Victoria who was born in Toledo in December 1882. My mom would not have known her Aunt Rose as Rose passed away in 1916. Mom did have a vague memory of Victoria — mom was born in 1926 and Victoria died in 1936 — mom would not have recalled much other than her relationship to Victoria. Because of Rose’s and Victoria’s birth, I was able to pinpoint that their father would have come to the US sometime in 1880 and without this knowledge, I would not have been able to locate any other documentation for Andrew for his brief life in the US. I was thrilled to realize that he would have been able to vote in the US before his death. Through my grandmother, Anastasia Przybylski Plenzler, I learned of cholera and typhoid outbreaks in urban regions of the US during the early 1900s. It was her first husband, Stanley Lawecki, who died of typhoid in 1910 and her first child, Daniel, who died of cholera a few months later. There is great value in researching those collateral family members. Don’t stick to a linear branch of your family tree, especially if you are stuck. Dig into those children, nieces, nephews, aunts, grand uncles, and in-laws. You can find valuable information and understand your common grandparents or great-grandparents so much more if you do. My thinking is that the value of genealogy is not the pedigree you are building–if we all dig far enough or hard enough or long enough, we’ll probably find someone at least semi-famous or of some nobility. What does that really mean if you do not understand the full history behind what occurred in your family and bought you to where you are now and made you who you are? I may be in a minority: I still haven’t located anyone remotely famous or even remotely connected to nobility or royalty in my family tree. When I hear someone claim they’re related to Robert E. Lee or have a story of a connection to the Windsors, I listen politely and move on and wonder if he or she has missed the richness of the history that surrounds them and fully understands the sacrifice, love, and labor that brought them to where they are now. I don’t dismiss anyone’s research, and a connection to Robert E. Lee is certainly an important and interesting connection to history. But I urge anyone to avoid becoming entrapped in attempting to prove or finding a “proper” or “important” pedigree via proxy. That eagerness may cloud your judgement–if you are indeed something like a fifth or sixth cousin to Robert E. Lee, look deeper. How did that influence your family’s role in history and how has that help mold who you are today? Do not live vicariously through the shadows of long-gone ancestors–you’re missing the richness of who you are and what your family gave you. Rather, dig deeper and learn your family’s role in history and how it created who you are and how you came to be! Your parents may have been paupers, but there was not a linear chain of events that brought them to their station in life, but rather a three-dimensional web that created the world in which they both struggled and flourished as well. Learn that story! Andrew Przybylski: a new discovery! I thought I’d post something sappy or funny about Thanksgiving. NOT! I came across something much more interesting even than Puritan pilgrims, turkey and sweet potatoes. And this is something I am thankful for finding! How about finding your “pilgrim” great-grandparent’s citizenship papers from 1880? I was at a point where I didn’t believe I would find much more on Andrew or his wife, Frances. I set out to see if I could locate naturalization or citizenship information on my Mierzejewski relatives. Alas, I came up empty handed with that effort except for one (and that will be the subject of another post at another time). But I went to the library with a list of names (Mierzejewski, Plenzler, and Przybylski) that I wanted to look for, at least through a list of voter registrations. The Toledo Lucas County main branch library has lists of registered voters that go back to at least the 1850s through the 1920s or so. I thought it would be a good stab in the dark to see if I could trace any relatives through those lists. And while I came home with little new Mierzejewski information, I feel I’ve hit a gold mine with this find and some records for the Plenzler family as well (and those too will be a subject for another time). Another thing to notice on these documents, and it may be valuable to follow up with this in the future, is that Andrew’s surname was recorded incorrectly on the documents! The surname was spelled as PRZIBLSKI by the clerk. However, if you investigate the signature, Andrew had spelled his last name as PRZYBYLSKI. Andrew’s first children born to Frances were born in Poznan (Marianna in 1875, Frank in 1876, John in 1878, and Rose in 1880). I cannot definitely state that Andrew had come once to the US and remained permanently. I had searched so far in vain for any corresponding manifests that locate him in the 1880s–the only one I have been able to find so far has been through Castle Garden showing that he arrived here in February 1882. This would coincide possibly with him arriving here with his family–daughter Victoria was born in December of that year and there is a baptismal record via St. Anthony’s parish proving her birth in the US. This was extracted using the voter registration lists from the 14th Ward for the period of around 1890. Vance Street, where the Przybylski family resided, was in the 14th Ward. And…(baited breath…drum roll)… I had also located what appears to be son Frank’s Certificate of Naturalization, marked as “Minor’s Papers.” The dates on this document line up perfectly. Frank was born in 1876 and would have been 19 or 20 years of age at the time this legal document was executed. Per the librarian I spoke to, children were naturalized through their fathers (as were wives through their husband) during this period. However, a certificate of naturalization was an instrument for males particularly becoming of age in order to vote, marry, and join the military during this period. Additionally, From 1824 to 1906, minor aliens who had lived in the United States 5 years before their 23rd birthday could file both their declarations and petitions at the same time. See Frank’s certificate of naturalization (“minor’s papers”) below. With this, I must say I am grateful for libraries that keep all kinds of wonderful information, even if that information rarely sees the light of day. I had a wonderful librarian in the history section who knew exactly where to look for such arcane information — it was she who knew about the existence of the old voter registration lists from the late 1800s and informed me that if indeed one was registered to vote, there would likely be a copy of that person’s naturalization papers somewhere. Now, I have not found Andrew’s “final” papers–those that had declared his citizenship. But we know he must have obtained it if he were able to vote prior to his death in 1894! The Toledo-Lucas County Public Library has a number of historic photos on its website. To get a glimpse of what life was like for the Plenzler, Przybylski, and Mierzejewski ancestors, visit the site. It is located here: http://images2.toledolibrary.org/image_dc.asp. Particularly interesting are the collection of photos for the industries for which Toledo was famous: Willy-Overland (now Chrysler Jeep), Champion Spark Plug, Auto Lite, and others as well as some photos of the strikes that occurred as well as photos of neighborhoods and churches. 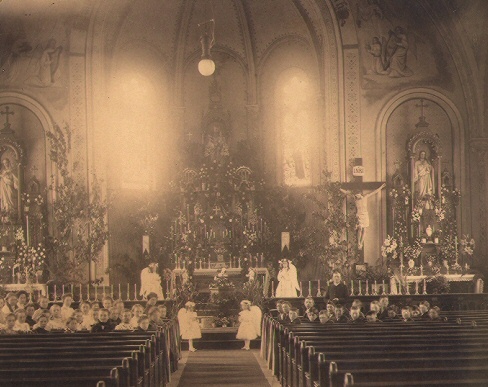 As a teaser, I’ve linked to a photo of the interior of St. Anthony’s church, about 1900, of a service in progress. I promised myself today that I would not sit behind my computer all day doing genealogy. Promises were made to be broken. I intended only to write about the Zielinski family and a make a quick post about gleaning as much information from Google News Archives as possible before we lost that valuable and free resource. Well because it was a dreary, grey, dismal Sunday here, I hunkered down instead to poke through more of the Catholic Diocese of Toledo’s baptismal records, in an effort to see if I could locate Amelia Zielinski and a few others there to establish a date of birth. Needless to say, poking through those records is relatively dangerous for an adult fueled on coffee. I was scanning through the collection from St. Stanislaus’s parish and a name popped up that I had never seen before, but really feel compelled to research soon. Now, I have more strong evidence that there were Mierzejewskis residing in Toledo prior to my grandparents’ arrival in 1923. However more research will be needed as I do not know who this Wenceslaus may be. To the best of my knowledge, neither of my grandparents had a sibling whose name was Wenceslaus. Earlier, I had found a Constantia Mierzejewska just by strolling through Calvary Cemetery and photographing graves. It seems as if a number of Mierzejewskis had arrived in Toledo prior to my grandparents. I had to make a quick post about this because this is a very intriguing discovery for me. I’ve often wondered why in the world my grandparents would have settled in Toledo, Ohio–face it, the only thing Toledo had going for it back then was the many, many industrial jobs connected to the auto industry in Detroit. It had no better weather than the east coast–Lake Erie winters are no picnic, the job market was not exactly kind (Toledo and Detroit were the epicenter of violent strikes in the 1920s through the 1940s, and there were a number of industrial accidents), and the area was riddled with quite a bit of crime during the heydays of Prohibition. The only things Toledo had going for it is that it was a fairly inexpensive place to live and that it had a need for much backbreaking unskilled labor. So my curiosity is aroused once more. If anyone knows of a Wenceslaus Mierzejewski, please drop me a line her or an email and I’ll follow up. As I can find further information, I will post it as well.